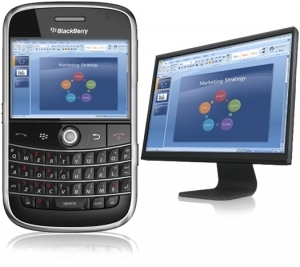 PocketMeeting brings desktop screen sharing to the BlackBerry Bold | BlackBerry Blast! PocketMeeting has launched a screen sharing app and it works on the BlackBerry. PocketMeeting is a dead simple web application for screen sharing. It is pay per use, and doesn't require any download or account setup - it will also run on your BlackBerry Bold. Whether or not PocketMeeting supports other BlackBerrys is unknown at this time. Check out the PocketMeeting web site at the link below for more information.